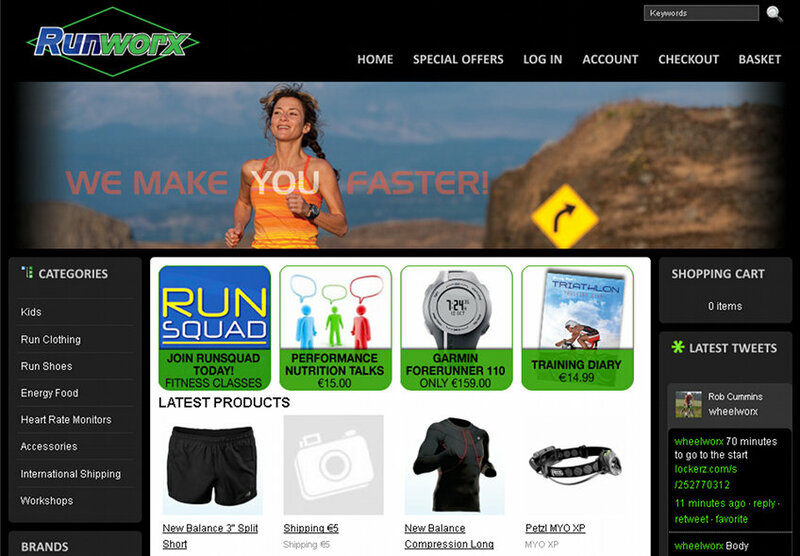 Rob required an ecommerce site for the new specialist running shop within Wheelworx. We took the opportunity to change from osCommerce to OpenCart. vqMod allowed me to make numerous virtual changes to core files without actually modifying them! Back in 2007 I developed Wheelworxbikes.com using osCommerce. Late in 2010 Rob asked me to set up an online shop for RunWorx, a new specialist running shop within Wheelworx. As the osCommerce interface for adding product attributes (e.g. sizes and colours) is tedious and cumbersome, Rob asked me to look at alternative e-commerce solutions. I considered Zen Cart, an enhanced version of osCommerce, but the product attribute interface was similarly tedious. Then I came across OpenCart. It has a very modern administration interface and a modular theme framework. I purchased a theme and began modifying it for Runworx. As most of the products for the Runworx store were in Wheelworx osCommerce store, I bought an osCommerce to OpenCart import script to import them. As you can read at my post about the script, the script needed a lot of work to make it somewhat user friendly but it did a great job for me. With osCommerce, enhancements often required modifying the core code. Sometimes multiple enhancements would modify the same file and upgrades to the core code or the enhancements was very tricky. An OpenCart maintainer developer vqMod that allowed virtual editing of files, including core files via xml patch files. Disabling patches is trivially easy and the actual files are never modified. I developed a number of xml patches e.g. one to display WordPress posts on the home page, one to display news from Geeklog, another to make text changes to the theme being used. I also used a number of xml patches from the OpenCart community. I later converted Wheelworx from osCommerce to OpenCart.